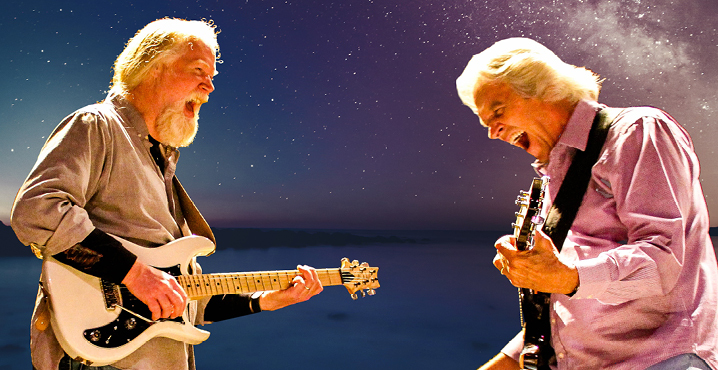 Guitar legends John McLaughlin & the 4th Dimension and Widespread Panic's Jimmy Herring & The Invisible Whip join forces for McLaughlin's farewell tour—featuring each artist in separate sets followed by a performance of music McLaughlin played with his 1970s electric band, Mahavishnu Orchestra. For more than five decades, the music of English guitarist, bandleader and composer John McLaughlin has transcended boundaries, securing him a spot as one of improvised music's most influential artists. A pioneer of jazz fusion, his genre-busting Mahavishnu Orchestra is remembered for a complex, virtuosic style that melded electric jazz and rock with Indian influences, resulting in classic albums like Inner Mounting Flame, Birds of Fire, Between Nothingness and Eternity and more. For this tour (which McLaughlin has said will likely mark his last U.S. performances), the guitar great will revisit much of the music he first played with Mahavishnu, this time backed by his current band, 4th Dimension, featuring Ranjit Barot (drums), Gary Husband (keyboards, drums) and Etienne M'Bappé (bass). McLaughlin will share the evening with Jimmy Herring, the virtuoso guitarist who has long been at the creative forefront of the American rock-jam movement, known for his inspired contributions to the Aquarium Rescue Unit, The Allman Brothers, Widespread Panic, and The Dead. "Herring possesses the heart and soul of a rocker, the chops and harmonic awareness of a jazz artist, and the simpatico personality of a jam-band player," says Guitar Player. Co-produced by NJPAC and WBGO Jazz 88.3FM, the TD James Moody Jazz Festival was inaugurated in 2012 and named in recognition of the jazz saxophone virtuoso from Newark. NJPAC's annual celebration of "America's classical music" is a spree of more than two dozen concerts and related activities - over half of which are free to the community. Guided by Christian McBride, NJPAC's Jazz Advisor, the festival has presented artists such as The Manhattan Transfer, David Sanborn, Tony Bennett, Wynton Marsalis, Al Jarreau, Dianne Reeves, Sérgio Mendes, Bill Charlap, Esperanza Spalding, Fantasia, Chris Botti, Pat Metheny, and the Keith Jarrett/Gary Peacock/Jack DeJohnette trio, among many others. TD James Moody Jazz Festival is intrinsic to Newark, a city renowned as the home and creative inspiration for jazz geniuses including Sarah Vaughan and pianist Willie "The Lion" Smith, and institutions such as Savoy Records, the Rutgers-Newark Institute of Jazz Studies and WBGO Jazz 88.3FM. Among the festival's unique events are One on One with Christian McBride, a concert-and-conversation series featuring jazz's top talents; Dorthaan's Place Sunday jazz brunches at the Arts Center's NICO Kitchen + Bar; and a schedule of concerts and special attractions held off-campus throughout Newark.